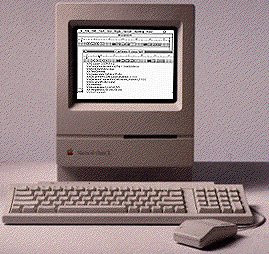 This was my first computer, a Mac Classic, circa 1991. It had a 40 megabyte hard disk and a processor screaming along at almost 8 megahertz! It had a tiny black and white screen [not even grays, just black and white]. Writing had never been so easy as typing on the Mac. The words appeared on the screen magically. I bought a modem, even though I wasn’t sure what to use it for. I liked getting email from people outside of work, but internet content was still primitive. Compuserve was mainly a list of directories, like a card catalog. Clicking through them was tedious, but it infected me with a gambler’s excitement. If I dug around in there long enough, perhaps I’d find something valuable. The modem also allowed me to fax letters and resumes without a fax machine. This small improvement in transmissions got me two new jobs. I adored my Classic, but it was not portable. 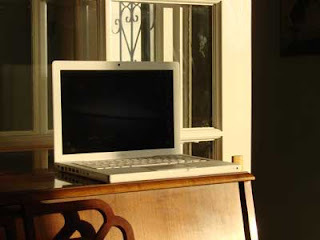 I dreamed of a notebook computer, and wondered when I might afford to buy one. A stroke of luck: I got a job at a company with lots of old computers. 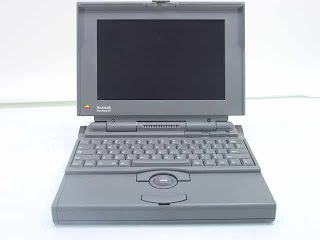 They gave me a PowerBook 165 for nothing. Once I put a computer on my knees, there was no going back to a big, heavy desk machine. By this time, there was more interesting, useful stuff on the internet. I joined Match.com and met several women I would never have been introduced to in my analog life. The next time I spent money for a computer, I got a bright color screen. The 1400c had enough go-power to let me design a web site. 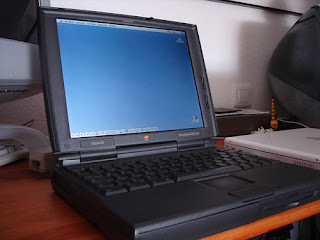 In 2000 I bought a black PowerBook Pismo. This machine had a 400mhz processor and could play DVD movies. This helped me peep in on popular culture, because I didn’t often go to a theater and didn’t have a TV [still don’t]. The Pismo was better for web design and photo-editing, but it gave me no end of trouble. I replaced the hard drive three times in the eight years I owned it. Last year I bought a white MacBook. It goes with me everywhere. So far it is a perfect machine; I don’t even restart it for a month or more. I used it to make my videos on YouTube. It has a 250 Gigabyte Hard Disk, 6,250 times the capacity of the Classic. When inflation is figured in, the MacBook costs less than the Classic did. The access, the mobility, and the ability to effect change are what will make the future so different from the present. The information superhighway may be mostly hype today, but it is an understatement about tomorrow. It will exist beyond people's wildest predictions. Mr. Negroponte, you were right.